Previous posts have described the Indian skirmishes at William “Short-Arm Bill” Parker’s place on Alapaha River in Berrien County (Martha Guthrie: Babe of the Indian Wars, Short-arm Bill Parker). On the 13th of July, 1836, on the Allapaha River, near the plantation of Mr. Wm. H. Mitchell, a battle was fought between the whites and Indians. Captain Levi J. Knight commanded the whites, numbering about seventy-five men. The Indians were defeated, and all killed except five. Twenty-three guns and nineteen packs fell into the hands of the whites. The following account of the incident is quoted from Georgia’s Landmarks, Memorials and Legends, published in 1914 by the Georgia state historian, Lucian Lamar Knight. (For Levi J. Knight’s own account, see Levi J. Knight Reports Indian Fight of July 13, 1836). Captain Knight was soon on the trail of the squad and overtook them near the Alapaha River, not far from Gaskin’s mill-pond. The sun was just rising when the gallant company opened fire on the savages. A lively fight ensued, but it soon terminated in an utter rout of the Indians, who threw their guns and plunder into the river and jumped in after them. A few were killed and a number wounded. One Indian was armed with a fine shot-gun. This he throw into the river. He also tried to throw into the stream a shot-bag, but it was caught by the limb of a tree and suspended over the water. Strange to say, it contained Mr. Parker’s money, every cent of which was recovered. The fine gun was fished out of the river and was afterwards sold for $40, a tremendous price for a gun in those days. Having driven the Indians from the dense swamp beyond the river, Captain Knight marched his company as rapidly as possible in the direction of Brushy Creek, in the southwest part of the county [i. e., Lowndes]. In the distance they heard a volley of small arms. On arrival, they found that a battle had already been fought, and the volley was only the last tribute of respect over the grave of a comrade-in-arms, Pennywell Folsom. Mr. Robert Parrish, who became quite prominent and lived near Adel, had his arm broken in this fight. Edwin Henderson was mortally wounded and died near the battlefield, and there were two others killed. The Indians lost 22, besides a number wounded. The battle was fought in a swamp where Indian cunning was pitted against Anglo-Saxon courage, and in five minutes after the engagement opened there was not a live red-skin to be seen. From this place Captain Knight marched his company into what is now Clinch. He overtook the Indians at Cow Creek, where a sharp engagement occurred. Three were killed and five made prisoners. Mr. Brazelius- Staten was dangerously wounded, but finally recovered. This ended the Indian fighting in which Captain Knight’s company was engaged. More than three quarters of a century has since passed, and the actors in the bloody drama are now at rest. Fearing for their lives and in obedience to Governor William Schley’s orders, the people, of what is now Cook County, gathered themselves into three different groups and built three forts. The Wellses and Rountrees and their neighbors built a fort at the Rachel Morrison place which is now the John Rountree old field. This was Morrison Fort and the company of soldiers formed there was known as Pike’s Company. The Futches and Parrishes and others built their fort at the Futch place on the Withlacoochee River where the ferry was located. The McCranies and their neighbors built their fort on Brushy Creek where the George Moore farm is now located. Their company of soldiers was known as the Hamilton Sharp Company. Scarcely had the people of the present county gotten into forts and formed companies for fighting when the hostile Creeks and Cherokee Indians, coming from the North to join the neighboring Seminoles in Florida, began murdering families along the way. The soldiers of the Hamilton Sharp Company at the McCranie Fort looked out one morning about the 10th of June 1836 and found the woods just across the Musket Branch from their camp, literally full of Indians. They saw they were so completely out-numbered that they sent Mr. Ashley Lindsey through the country to the Morrison Fort to get aid from Pike’s Company. While he was gone for help, Hamilton Sharp, Captain of the McCranie Fort, sent out Robert N. Parrish, Richard Golden, Penuel Folsom and William McCranie as scouts to guard the Indians until help could come. The Indians out-witted the scouts and decoyed them away from their camp and attacked them. They wounded Robert N. Parrish and Penuel Folsom. Folsom was mortally wounded and just as the Indians got to him to scalp him, Pike’s Company came up in the rear, began firing and the Indians fled across Brushy Creek. The companies were all soon united and together they pursued the Indians, killing men, women and children. Numbers of Indians were killed that day. Pike’s Company lost three brave soldiers, James Therrell, Edwin Shanks and Edwin Henderson. Penuel Folsom, the first soldier killed in the Battle of Brushy Creek, was buried in what is now known as the Rountree Cemetery, his being the first grave in it. After this terrible battle with the Indians, it was found that an Indian maiden had been captured and held at the fort on Brushy Creek. That night she asked permission to yell and this permission was granted. Her mother soon came out of the darkness to the child and she was released to go with her mother. To the astonishment of all the whites, when morning came, every Indian corpse that could be found had his or her hands folded and each lifeless body had been straightened, but not buried. Their bodies were never buried. The companies drove the Indians south of Milltown, now Lakeland, Ga. There, they killed one of their biggest warriors. 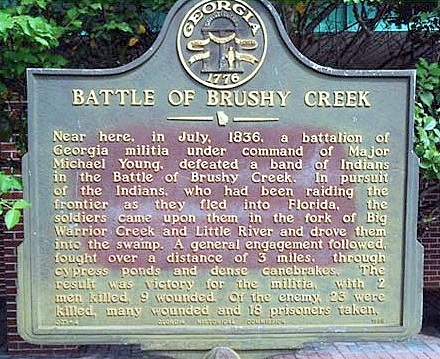 BATTLE OF BRUSHY CREEKNear here, in July, 1836, a battalion of Georgia militia under command of Major Michael Young, defeated a band of Indians in the Battle of Brushy Creek. In pursuit of the Indians, who had been raiding the frontier as they fled into Florida, the soldiers came upon them in the fork of Big Warrior Creek and Little River and drove them into the swamp. A general engagement followed, fought over a distance of 3 miles, through cypress ponds and dense canebreaks. The result was victory for the militia, with 2 men killed, 9 wounded. Of the enemy, 23 were killed, many wounded and 18 prisoners taken. In his 1916 account of the engagement, historian Folks Huxford continued this narrative with details of the concluding encounter at Cow Creek. William McCranie fought in the Battle of Brushy Creek and at Cow Creek. His personal account was related in the Berrien County Pioneer in 1888. He was engaged in two pitched battles with the Indians – at Brushy Creek, which was fought in sight of his father’s house, and on Cow Creek, in Clinch county. In both battles, his friend, Jack Lindsey, was close by his side and also in pursuit of the Indians that followed them. ‘Uncle Billy,’ as he is now familiarly called, has always been exceedingly reticent relative to the details of these battles, even to his wife and children. However, one incident of the pursuit of the Indians after the Battle of Cow Creek he sometimes tells with seemingly a pleasing smile. The Indians had been completely routed and the white men were in close pursuit. He and Jack Lindsey had crossed the creek and was emerging from the swamp when an Indian buck jumped from behind a covering of brush. They discovered each other simultaneously and three rifles flew to the shoulder in an instant, but he and Jack was too quick for their antagonist. They fired together, and the Indian with a yell fell dead – a ball in his heart. They fired together, aiming at the heart, and they never could say which killed the Indian. When they went forward to examine the dead Indian, a ‘gal’ jumped up from behind a clump of bushes, and ran to the edge of a cypress swamp where, for some unknown reason, she stopped. By this time some other white men came up, attracted by the rifle shots, and expressed surprise at the sudden disappearance of the Indians and their being unable to find one. “Come along,” said uncle Billy, “and I will show a ‘gal’.” They went to where she was but she would keep some distance between them. The men tried to coax her to come to them but she would not – said she was afraid they would kill her. Finally, Uncle Billy told her to come to him. She refused, but told him to come to her. As he started toward her, she started toward him, and they clasped each other in fond embrace, she gave him such a hug that he has never forgotten it. Whatever became of her Uncle Billy has never told.